Over the last several years The New York Pizza Project has been to over 100 shops, all over the five boroughs, capturing portraits and anecdotes celebrating by-the-slice neighborhood pizzerias. 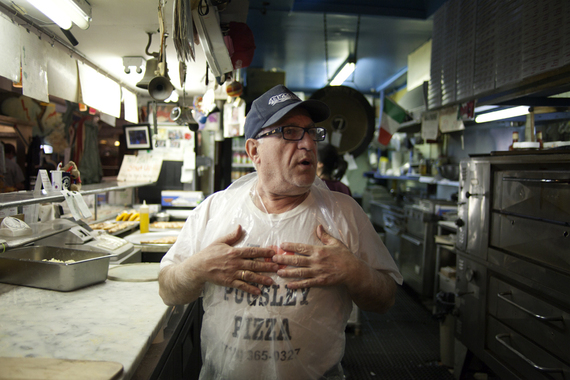 The people we've met, and the stories we've heard, gave us a glimpse of what makes New York pizza so special. 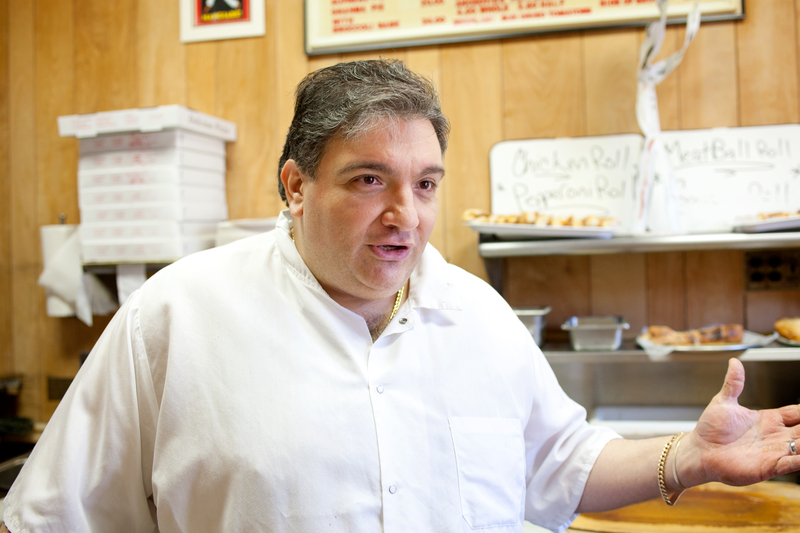 For us, the slice of pizza is a staple of New York's culinary heritage and part of the soul of our city. We've eaten lots of amazing slices from joints all over the city, and folks are always asking us, "which one is your favorite?" The truth is, you can't really go wrong. But, for those of you still looking for some more direction, here is a list of some of my favorite, lesser known, neighborhood pizzerias. The moment you step into Luigi's you feel at home. 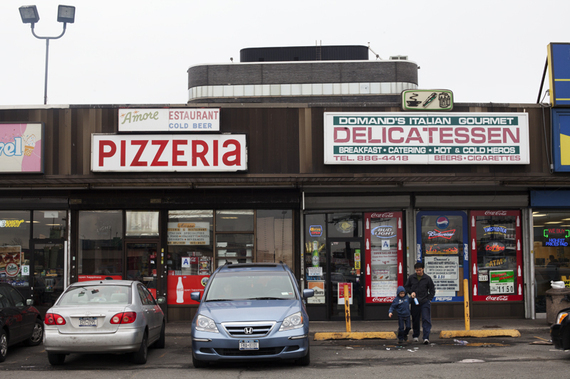 This South Slope institution has been around since 1973. Gio, the owner, and the rest of the team, are some of the friendliest New Yorkers you'll ever meet. Within my first five minutes in the shop, Gio was showing me his parent's photo album -- an amazing relic from the old country. Luigi's pizza counter is like the stage of a talk show, with regulars and tourists filtering in to get a glimpse of his pizza theatrics. It's also the local pizza haunt of actor Steve Buscemi. We do it the original way, I haven't changed a thing. See this is a cooked sauce, most people who are lazy use one sauce for everything. My mother used to make all the sauce, but now my sister makes everything in the back. Remember, for 53 years we have been making pizza and haven't changed the recipes. All I know is pizza and you have to love what you do. At this Fordham University slice joint, every day is your birthday. Don't be surprised if you find yourself on a conga line, following the vivacious pizza owner Sal, as he plays his trumpet. I said I want to open a place for students. A college place. This is it. It's a beautiful place with a lot of beautiful people here. We do music here. We do karaoke, we do performances. We have a blast. It's very fun. They say that we got the best pizza. I have an ego because I want to be the best pizza man. This joint is shouting distance to the Van Wyck, on the way to the Whitestone Bridge. It's located in a strip mall with a Pathmark, a liquor store that uses old Pathmark letters for its sign (true story), a Carvel, and a check cashing spot. 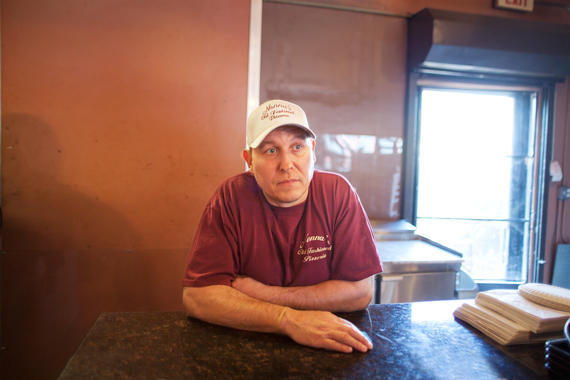 According to Andy, the pizzaman running the show for over 39 years, Amore is at the crossroads of the world, with LaGuardia Airport just stone's throw away. So while Amore's might not scream "neighborhood" on the outside, on the inside, it's all friends and family. This was my first job. My boss taught me. I was 15 years old. I started washing dishes in the back and everything. The ingredients: me and my boss know the secret. Nobody else knows. Nothing really changes. Same recipes. We use the best. Out of all New York pizza, we sell the most. We don't have no display counter. It's always fresh coming out. Every pizza maker we've interviewed takes pride in their ingredients, and the team at Nonna's is no different. The team at Nonna's hand-makes their mozzarella, and they go through over 2,500 pounds of the stuff every week. They've been perfecting their craft for generations, and it shows. My great grandparents came from the other side. Italy. We are from Sicily. We make the best pizza. If you walk around outside and ask people, "Where is the best pizza?" See how many answers you get. I got people near the mall telling other people "You should go by Nonna's." 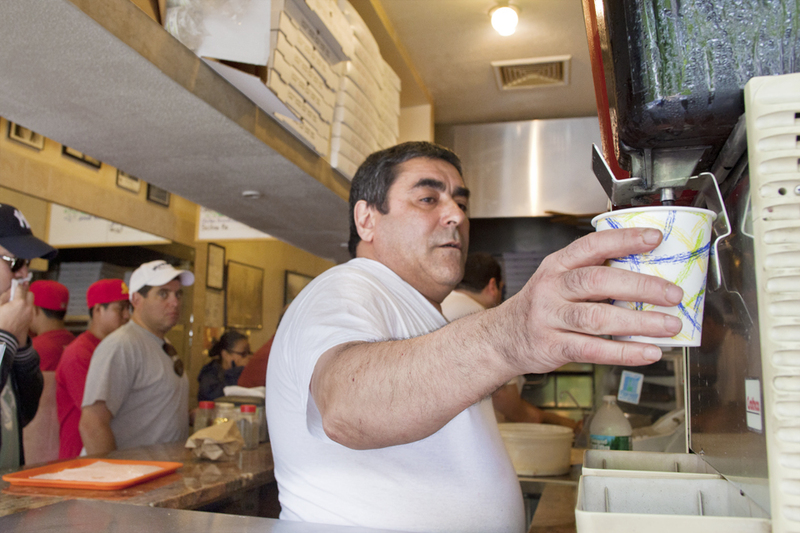 Sacco Pizza, in Hell's Kitchen, which is featured on Eater's list of oldest pizzerias in the city, has been serving up slices on the same block for over 50 years, and run by the current owners, cousins Dominick and Giuseppe (Joe, to most), for over 30. Fifty years on one block is a long time. Dominick says they've been able to stick around because they put out a good quality product, and he and Giuseppe, along with their two sons, still put in 10-hour days. Good product. You gotta use a good product. Gotta give the people what you pay for. Like now you see 99-cent pizza, what do you expect? I don't really care... to me I wouldn't eat it. It's like you go buy a pair of shoes, you pay $10; then you go buy a $100 pair of shoes, which is your foot gonna like better? The $100 pair of shoes are gonna fit like a glove, the $10 pair of shoes are gonna give you a corn on the side of the foot. It's everything.